Motivated by the seasonality found in equity returns, we create a Turn-of-the-Month (ToM) allocation strategy in the U.S. equity market and investigate its value in asset allocation. 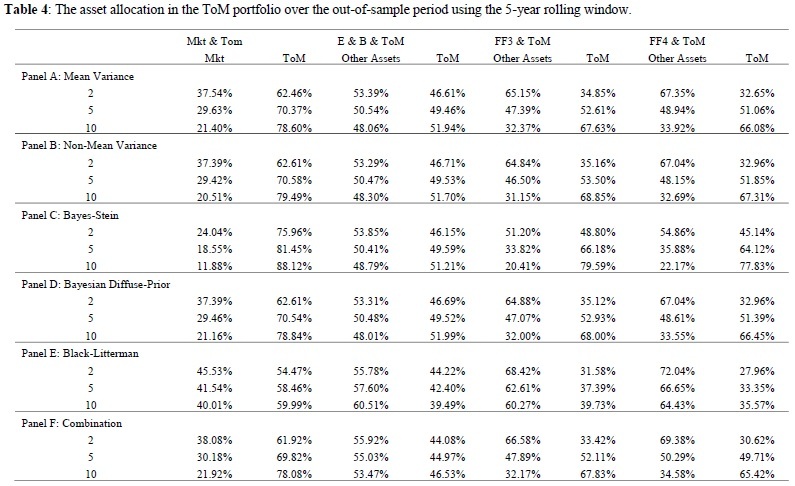 By using a wide variety of portfolio construction techniques in an attempt to address the impact of estimation risk in the input parameters, we show significant out-of-sample benefits from investing in the ToM factor along with a traditional stock-bond portfolio. The out-of-sample benefits remain significant after taking into account transaction costs and by using different rolling estimation windows indicating that a market timing strategy based on the ToM offers substantial benefits to investors when determining the allocation of assets. "Seasonality is a well-known characteristic of financial markets with much empirical literature noting various types of seasonality in stock returns. Simple seasonality-driven investment strategies have attracted significant interest from academics and investors over the last forty years. Amongst the calendar effects, the turn-of-the-month (ToM hereafter) has been acknowledged as one of the strongest and persistent seasonality found in stock returns. The ToM effect is the tendency of the stock market returns to display particularly high returns on the last trading day of the month and the first three trading days of the next month. This study contributes to the literature on calendar anomalies in several dimensions. We examine the out-of-sample portfolio benefits resulting from adding the ToM portfolio to (i) a traditional equity-bond mix, (ii) a market portfolio, (iii) a portfolio which consists of the market portfolio, the small size portfolio and the value portfolio, and (iv) a portfolio, which consists of the market, the small size, the value portfolio and the winner portfolio. We employ a wide variety of sophisticated and popular asset allocation techniques to provide robustness to our results. 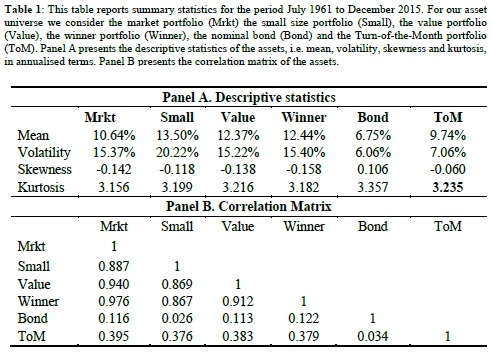 Specifically, we employ the mean-variance (Markowitz) portfolio optimization, portfolio optimization with higher moments, Bayes-Stein shrinkage, Bayesian diffuse-prior portfolio, Black-Litterman and another portfolio construction method that combines individual portfolio techniques, to ensure that our results are not just a peculiar artefact on one particular asset allocation technique. Finally, we assess the ToM for low, medium and high-risk averse investors, as its effectiveness in the portfolio might depend on the investor’s level of risk aversion. Our empirical evidence suggests that the ToM portfolio adds value when included in different portfolios. Our results hold for different levels of risk aversion, portfolio techniques and estimation windows. Finally, our results are not eliminated by the including realistic transaction cost estimates, indicating that the creation and implementation of a ToM factor should be of great interest and potential value to investors. Title: Have Capital Market Anomalies Worldwide Attenuated in the Recent Era of High Liquidity and Trading Activity? We revisit and extend the study by Chordia et al. (2014) which documents that, in recent years, increased liquidity has significantly decreased exploitable returns of capital market anomalies in the US. Using a novel international dataset of arbitrage portfolio returns for four well-known anomalies (size, value, momentum and beta) in 21 developed stock markets and more advanced statistical methodology (quantile regressions, Markov regime-switching models, panel estimation procedures), we arrive at two important findings. First, the US evidence in the above study is not fully robust. Second, while markets worldwide are characterised by positive trends in liquidity, there is no persuasive time-series and cross-sectional evidence for a negative link between anomalies in market returns and liquidity. Thus, this proxy of arbitrage activity does not appear to be a key factor in explaining the dynamics of anomalous returns. (iii) increased volume is associated with higher market quality (i.e., closer conformity to random walk behaviour). Motivated by these observations, several studies have analysed whether increased liquidity has triggered greater anomaly-based arbitrage and thus attenuated capital market anomalies. In their conclusion, Chordia et al. 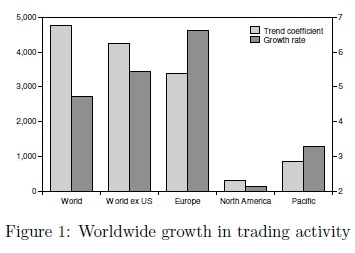 (2014, p. 57) argue that "return predictability would diminish to a greater extent in countries that have experienced greater enhancements in trading technologies and larger increases in trading activity and liquidity" and that this "hypothesis awaits rigorous testing in an international context". This is where we step into the picture. We extend the hedge portfolio evidence of Chordia et al. (2014) to an international setting. Using a novel dataset containing arbitrage portfolio returns for the four well-known anomalies of size, value, momentum and beta for a wide range of developed stock markets, we start our analysis by testing whether these anomalies still exist and whether the corresponding arbitrage portfolio returns exhibit trending behaviour. We also investigate trends in market liquidity in a more detailed fashion than in our previous illustration. cant decreases of anomalous returns in the US and the majority of other markets. We cannot establish a persistent negative link between arbitrage portfolio returns and share turnover in both the time-series and the cross-sectional dimension. These results suggest that aggregate liquidity may be a measure too coarse for our purposes or that liquidity in general may not be the key driver of the dynamics of international anomaly portfolios." "Alternative risk premia investing has grown rapidly in popularity in the investment community in recent years. They provide systematic exposures to risk factors and market anomalies that have frequently been widely analyzed in academic research. 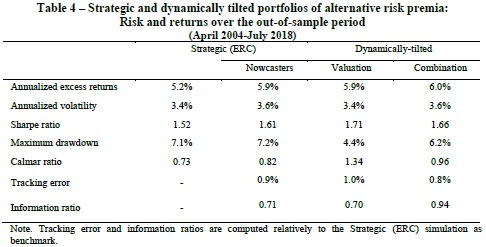 The vast majority of the academic literature solely focuses on the identification and the analysis of individual alternative risk premia strategies. On the contrary, this article addresses the question of allocation among alternative risk premia. The standard approach in the industry is to apply a risk-based allocation mechanism, particularly equal risk contribution (ERC) in which one allocates the same risk budget to all components in the portfolio. One of the perceived key benefits of this approach is that it does not require expected returns as input but solely risk measures, hence the name “risk-based”. This no-views/agnostic feature alleviates the pitfalls of forecasting, which is already a challenge for traditional assets but even more so for alternative risk premia that are newer or are perceived as more complex strategies. Despite this, recent research lends more support to the idea of some predictability of factor returns. In this article, we extend those results by focusing on the relationship between alternative risk premia and macro regimes that we define through nowcaster indicators. We consider that three major macroeconomic risks that affect risk premia: growth, inflation and market stress/volatility. To model the influence of these macro risks, a regime approach has proven effective. 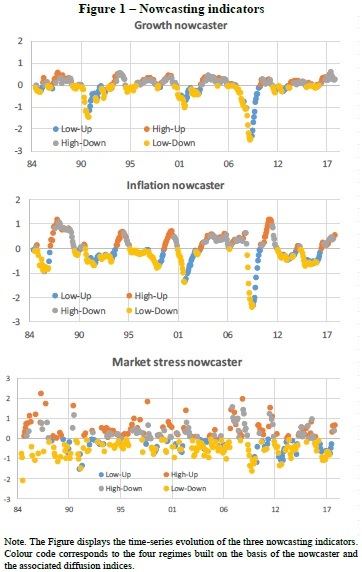 To characterize macro regimes for growth, inflation and market stress, we build our own nowcasting (contraction of “now” and “forecasting”) indicators since 1990. Seeking for simplicity, our nowcasters are simple averages of z-scores of a large cross section of indicators across a large set of countries. For instance, the “growth” nowcaster contains close to 500 economic times-series across major developed and emerging countries accounting for 85% of world GDP. In Appendix A, we provide more details on the construction of the nowcasters. For the growth factor, this is similar to the usual Recession (Low-Down) / Recovery (Low-Up) / Expansion (High-Up) / Slowdown (High-Down) classification. In Figure 1, we represent the different macro factor nowcasters and highlight different regimes by using a distinctive color scheme. 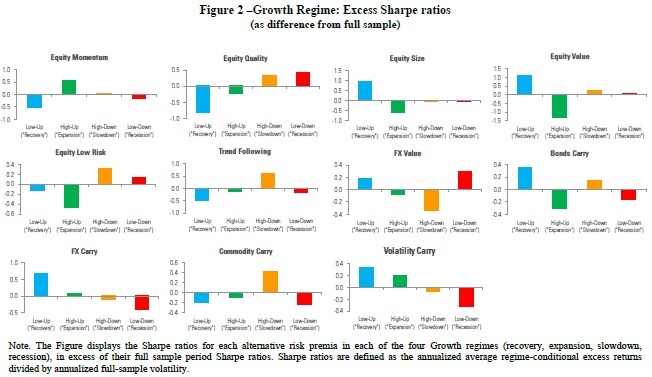 To give a first sense of the sensitivity of alternative risk premia to macroeconomic regimes, we represent in Figure 2 growth regime-conditional excess Sharpe ratios, i.e. the difference between Sharpe ratios in each growth regime and the long-term (unconditional) Sharpe ratio. Some strategies can be seen as being “defensive”, as they tend to do relatively well in either slowdowns (High-Down regime) or recessions (Low-Down regime), such as equity quality, equity low-risk, trend-following, or bonds carry. Conversely, some strategies benefits from better economic conditions such as equity size, FX carry or volatility carry. In next section, we define and implement a process to allocate among alternative risk premia which incorporates, along other dimensions, each risk premium’s sensitivities to the macro regimes. The approach is based on the active risk-based methodology derived in Jurczenko and Teiletche (2018) which adapts Black and Litterman (1992) framework to the risk-based world. In practice, the model ends up combining a risk-based strategic portfolio with a set of dynamic allocation active views. As our focus is on dynamic signals, we do not seek to improve the strategic portfolio. We adopt a simple ERC portfolio, which consists of equal contributions to portfolio volatility across all alternative risk premia. The strategic portfolio is then modified to incorporate dynamic deviations in two steps. In a first step, we compute z-score reflecting dynamic allocation based on an equal-weight of two z-scores, for macro factors and valuation respectively. Regarding macro factors (growth, inflation, market stress), z-scores are computed as the excess return in the current (“nowcasted”) regime vs full sample return scaled by historical volatility. In the second step, these dynamic z-scores are transformed into active portfolio deviations calibrated to deliver 1% tracking-error relative to the strategic portfolio. The sum of active deviations is set to zero, so that the portfolio is fully invested, similar to the strategic allocation. Table 4 summarizes the performance statistics of the portfolio. The first column shows the strategic ERC portfolio. The second to fourth columns show the “dynamic” portfolios that incorporate active tilts, based on nowcasters and valuation signals individually and in combination. Title: Does Too Much Arbitrage Destablize Stock Price? Evidence from Short Selling and Post Earnings Announcement Drift. Stein (2009) suggests that too much arbitrage capital exploiting underreaction can lead to overreaction, pushing price further away from fundamental value. I test this hypothesis by investigating the relation between changes in short interest ratio around earning announcement and the subsequent drift return. There are two main findings in this paper. First, my results suggest that too much arbitrage capital does contribute to overreaction (with a t-statistics around 4 on average). These findings are robust to alternative sample periods or length of the window for drift calculation. Second, contrary to the findings in prior literature that show that short sellers mitigate the magnitude of drift, my results show that almost all of this effect are actually contributed by the observations that are more likely to represent overreaction. "Conventional wisdom believes that as more arbitrage capital starts to trade a given anomaly, any abnormal returns will be eventually eliminated (up to risk and limits to arbitrage) and stock prices will be pushed closer to fundamental values. In other words, the more arbitrage capital, the more efficient the market is likely to become. 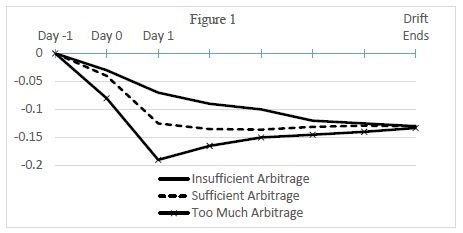 However, Stein (2009, Presidential Address: Sophisticated Investors and Market Efficiency) questions this simple intuition and shows that when the anomaly does not have a fundamental anchor and when arbitrageurs are not aware about how many other arbitrageurs are trading the same anomaly, arbitrage activity may lead to price overshoot, pushing price further away from fundamental value. Prior literature has very little empirical evidence regarding this implication. Therefore, in this study I try to test whether too much arbitrage capital destabilizes stock price. The anomaly utilized in this paper is post earnings announcement drift (henceforth, PEAD). Three major advantages associated with PEAD makes it an ideal setting for testing the above implication. First, it does not have a fundamental anchor so that arbitrageurs do not have a benchmark to gauge the level of under or over valuation. Second, it is one of the most persistent anomalies that are often followed by actively managed hedge funds. Third, it allows me to pin down the time at which arbitrageurs are most likely to take actions – that is, if an arbitrageur was to maximize his profit, he would be more likely to take action in a tight window around the earnings announcement date. The proxy for arbitrage capital is the change of short interest ratio around earnings announcement date. It is widely documented that short sellers tend to be informed traders who incorporate information and move prices closer to fundamental values. Also note that, in this study, I only focus on announcements with negative earnings surprise since these are the stocks that short sellers are more likely to target. The relation between PEAD and change of short interest ratio is illustrated in figure 1. Day 0 is the date when the earning announcement is released. Day -1 is one day before and Day 1 is one day after the announcement date. Together, the 3-day window forms the initial response period in which arbitrageurs will trade most intensively. The solid line illustrates the return pattern for negative earnings surprise announcement with insufficient arbitrage capital. In this case, a minor negative return is realized in the initial response period which is followed by a further negative drift. The dashed line illustrates the case when there is sufficient arbitrage capital. In this case, more arbitrage capital adjusts the price to fundamental value faster and therefore a moderate negative return (more negative than the solid line) is realized and no obvious further drift follows. The crossed line illustrates the case when there is too much arbitrage capital. In this case, due to too much arbitraging, a large negative initial response (potential overshoot) is followed by a positive drift (correction). My findings suggest that too much arbitrage does seem to destabilize stock price. First, holding all else equal, announcements with larger increase in short interest ratio experience significantly more negative initial response (more correction). Next, I show that negative earnings announcements with positive abnormal drift have significantly higher change in short interest ratio than those with negative abnormal drift. 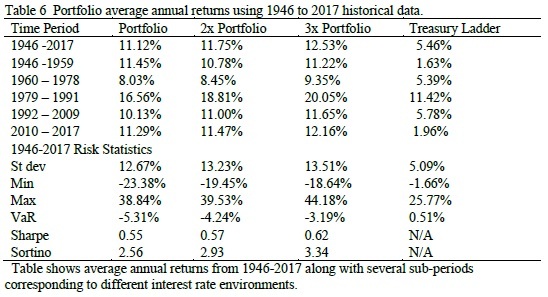 Moreover, I find that, holding all else equal, stocks with the largest increase in short interest ratio (SIR decile 10) is almost 10% more likely to result in overreaction than stocks with the largest decrease in short interest ratio (SIR decile 1). In the end, I show that, holding all else equal, change in short interest ratio significantly contributes to overreaction. In particular, within stocks that have positive abnormal drift, the ones that experience the largest increase in short interest ratio average 1.55% higher drift than the ones that experience the largest decrease in short interest ratio. Robustness tests show that my results are not likely to be driven by extreme values in abnormal drift, particular year observations, or length of window for return calculations."